Jessica Hernandez, Dr. Kristiina Vogt, Isabel Carerra, Sam Zwicker, and students from Chief Kitsap Academy. 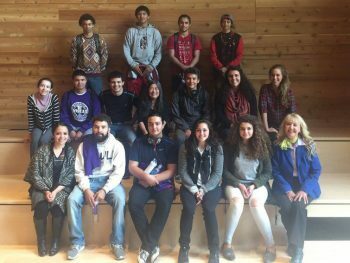 SMEA graduate student Jessica Hernandez recently organized a college immersion day for students from Chief Kitsap Academy. Chief Kitsap Academy is a tribal school with a program that is committed to the Suquamish Tribe’s mission of providing education that supports lifelong learning by respecting diversity and ancestral heritage through the acquisition of foundational knowledge, leadership, accountability, and critical thinking skills; providing students opportunities to acquire and practice leadership skills, integrity, honesty, teamwork, compassion, and communication skills. The immersion day was sponsored by SEFS, GO-MAP and the wǝɫǝbʔaltxʷ – Intellectual House and gave students an opportunity to experience a classroom lecture (ESRM 101 A: Forest and Society) with Professor Kristiina Vogt and guest speaker Mike Marchand, attend an I-school presentation, and tour the wǝɫǝbʔaltxʷ – Intellectual House. Jessica was also featured on the front page of the UW student newspaper The Daily, highlighting her involvement with the Native Organization of Indigenous Scholars (NOIS). To read more about Jessica and NOIS, click here.